This lovely piece for two flutes and piano was kindly contributed to our collection by Spanish composer Pablo Toribio. “Rivera” is the last of a set of four compositions for two flutes and piano titled La Princesa de la Media Luna (“The Princess of the Crescent Moon”). The title refers to an imaginary legend about the impossible love of a Christian prince for an Arab princess during the Spanish Middle Ages (The Crescent Moon is the reference to the corresponding Arab religious symbol). Rivera was the name of the Christian prince's legendary horse. This piece (which is actually a dance) is structured in several parts. The first part contains melodic material with an emotional character, using harmonies from the past such as a variant of the bass ostinato known as the Folia. The second part increases in dynamism and resorts to an ancient Spanish harmonic device: the Andalusian cadence. Around the harmonic ostinato, zigzagging passages for the different instruments appear. A subsequent part consists of a dance in ternary rhythm which is followed by another section containing essences of Arabic melodies. The piece ends vigorously. 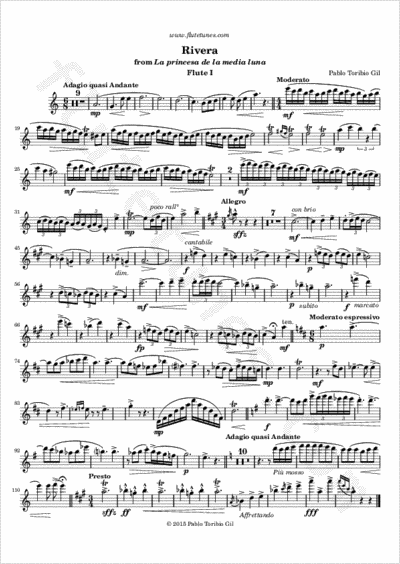 The formal organization of the piece consists of small thematic units, each with its own tonal character development, which are colored by the timbre of the transverse flute in its various registers. This piece, with its marked Spanish character, was successfully premiered by Trio Rigoletto in England (2014), and has subsequently been interpreted in different cities such as Seville, Jerez, Valladolid, Valencia and Bilbao.